Enamelling is an ancient craft, and is the fusion of glass to metal. 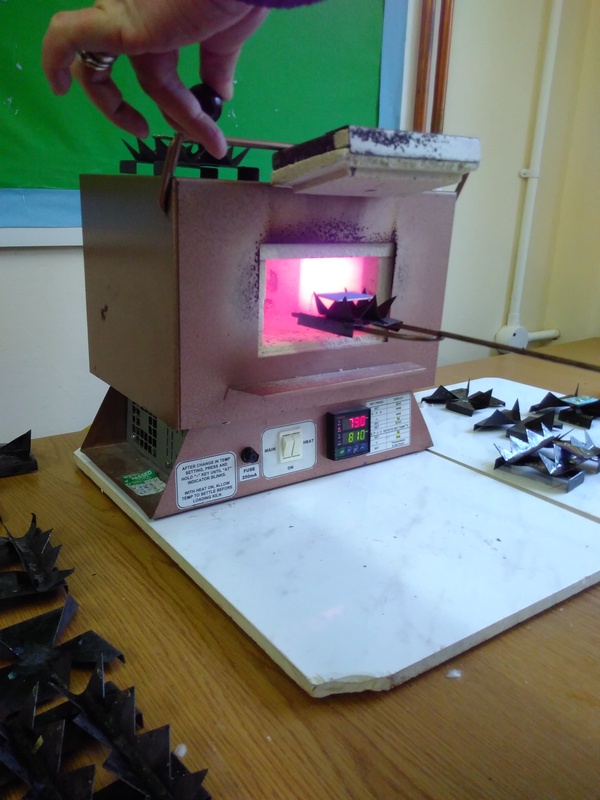 In my classes I teach enamelling using a table top (high temperature) kiln. We use copper as our metal base; although it is possible to use other metals such as silver, which can be costly and also can cause complications, the melting temperature of silver is very close to the fusing temperature of glass! Generally people make enamelled jewellery although there is the option to make decorative items. In my Enamelled jewellery Beginner’s class, we make around 3 enamelled pieces, using techniques such as sifting (the enamel comes in powdered glass form), wet-packing, and using media such as glass beads, silver contacts, glass threads and wire. In my Improver’s class, we look at techniques such as swirling (once students have developed some confidence using the kiln), sgrafitto, wire inlay (including an introduction to cloisonné), using silver leaf. I also offer a class where you can make a piece of fine silver jewellery (with silver clay) especially to enamel. I encourage students to work on their own designs, which we discuss and plan how to work on together. Contact me to book your tailored class at a date to suit.